Latest draws by Occupation In-Demand immigration, and Express Entry of Saskatchewan sub-categories on Nov 1 appeared in 926 ITA's for provincial nomination and gives the path for PR. 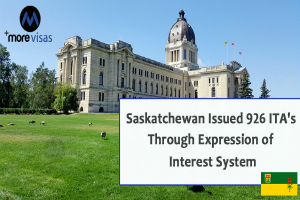 The connected requests are the most announced yet in a round of selection by Saskatchewan’s Foreign Skilled Worker system of E.O.I, which was launched in July to control the applicant’s pool for the Occupation In-Demand and Express Entry sub-categories. The invitations added a record above 671 to Profession In-Demand applicants, of whom the weakest-ranked had a score 61 points. It was the biggest invitations number, and the least score yet chosen for In-Demand Profession applicants in the 04 draws that have been conducted since the sub-category shifted to an E.O.I system. Applicants of Express Entry invited in this recent draw added 255 and the least-ranked applicant requested had a score of 60, which ties the weakest score chosen in the four EOI draws of Express Entry that has been conducted to date. To be recognized for Saskatchewan immigration by either the sub-category of Express Entry or Occupation In-Demand, the primary step is to produce an E.O.I profile. An E.O.I profile needs potential applicants to present information about their work experience, education, language proficiency, and various factors to establish their qualification. Qualified candidates have then announced a ranking score depends on the points evaluation grid of Saskatchewan. The greatest ranked applicants in both sub-categories are invited to appeal for a provincial nomination by general draws from the pool of EOI. Applicants who get an invitation to apply have only 60 days to present their appeal and all needed documents.